Lately I’ve been making a lot of healthy brain food that doesn’t taste like salmon. 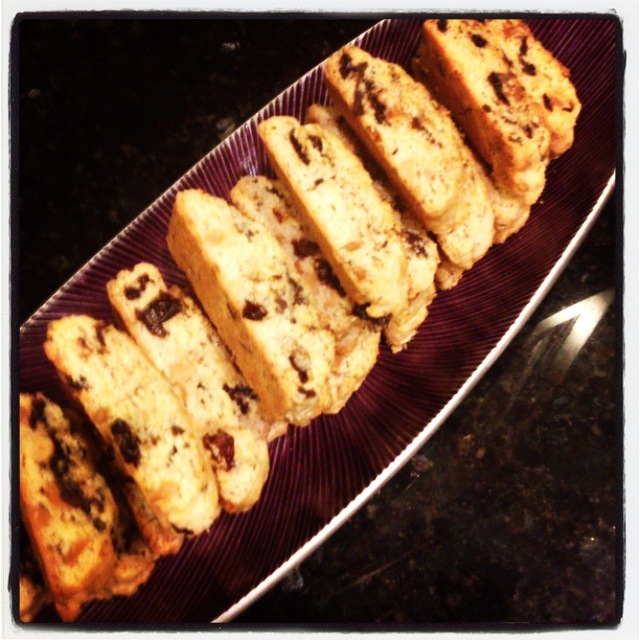 Here’s a biscotti recipe that I adapted from Ann Burrell that incorporates whole nuts, berries and dark chocolate in a not-so-sweet cookie for breakfast or dessert. She dips hers into a chocolate ganache, but I like the chocolate on the inside. It’s decadent enough without the dipped and extras. And it’s a long way from lox and better than a bagel. 1.) Preheat oven to 300°. Beat together the sugar and eggs until fluffy. Add eggs one at a time and then almond extract until well combined. 2.) Stir in flour, baking powder, salt and lemon zest. Fold in cherries, almonds and chocolate chunks until just combined. 3.) Divide the dough in half and shape two long, skinny logs on a piece of parchment paper about 12 inches long. You really don’t have to roll it out–it’s sticky but will shape nicely. Flatten the tops just slightly, and brush with the egg white until glossy and then sprinkle with the raw sugar. 4.) Bake for 35 minutes until somewhat firm–they bake again so it will be on the soft side at this stage. Remove from oven and cool 10-20 minutes before slicing into thick slices on an angle. 5.) Arrange the slices back on the cookie sheet and bake for another 10-12 minutes until hard. Cool completely on a rack. I don’t know how good it is for your brain, but it’s certainly good for the soul.